Engineer Fred Leuchter was hired by the state of Tennessee to evaluate, modify and update its electric chair, which it used for executions. The heavy oak chair was made from the wood that was once a part of the state's old gallows. Leuchter offered his services to modify the old equipment to make the chair both more effective and more humane. The state of Tennessee sent the chair to Leuchter's home, where he intended to work on it in his basement workshop. He took several photos of the chair before he started work to document his progress. This is one of the photos. When the photo was developed, Leuchter noticed several anomalies. Apart from the orb-like shapes, a few ghostly images can be seen. The orbs can most likely be attributed to the overhead light source reflecting on the camera lens. 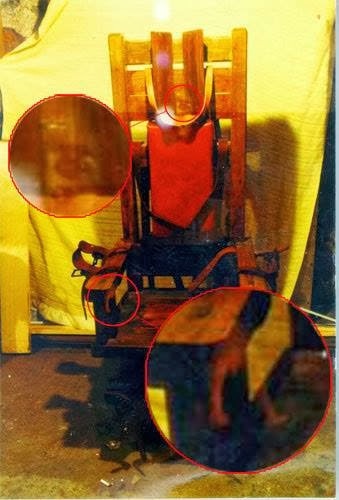 And the "face" on the back of the chair (enlarged on the top of the photo above) could just be interesting pareidolia. A little harder to explain, perhaps, is the ghostly hand image at the end of the right-hand armrest of the chair. This, too, could be pareidolia, but its resemblance to a limp hand exactly in the place where an executed man's hand would be is striking. Could it be the ghost of an executed man? Leuchter points out that the chair and its occupants were subjected to strong electromagnetic forces. Could they have imprinted it with these haunting images?